In today’s STEMdaily- we discuss the Girl Scouts’ new Hewlett Packard Enterprise Cybersecurity Badges, how government cyber workers are back at work and looking for evidence of any hacks during the government shutdown, Amazon is funding computer science classrooms in one of its new HQ2 locations, and more on Minecraft tips, a new manufacturing lab at a Pittsburgh university, and why maybe it’s not so bad to transfer for a Ph.D program if it’s not a good fit. In 2018, Girl Scouts of the USA announced a new set of STEM-oriented badges, including three cybersecurity challenges. Now, the largest Girl Scouts council in the country, Girl Scouts Nation’s Capital (GSNC — located in the D.C. area) is working with Hewlett Packard Enterprise (HPE) to take its troops’ cyber skills to the next level. Junior Girl Scouts ages 9-11 in the 60,000 member strong organization will be able to play a custom-made game to learn about privacy, online identities, security, and cyberbullying. Thousands of federal cyber workers are returning to their posts after more than a month on furlough today. And they have a big to-do list. The first priority: Looking for evidence of any major hacks that wormed through government defenses the past 35 days while agencies were working with a skeleton crew of security pros. Following Amazon’s decision to set up one of its new headquarters in Long Island City, Queens, the company announced this morning a plan to fund computer science classes in over 130 New York City area high schools. Specifically, Amazon will fund both introductory and Advanced Placement (AP) classes across all five NYC boroughs, including over 30 schools in Queens, near its new headquarters. 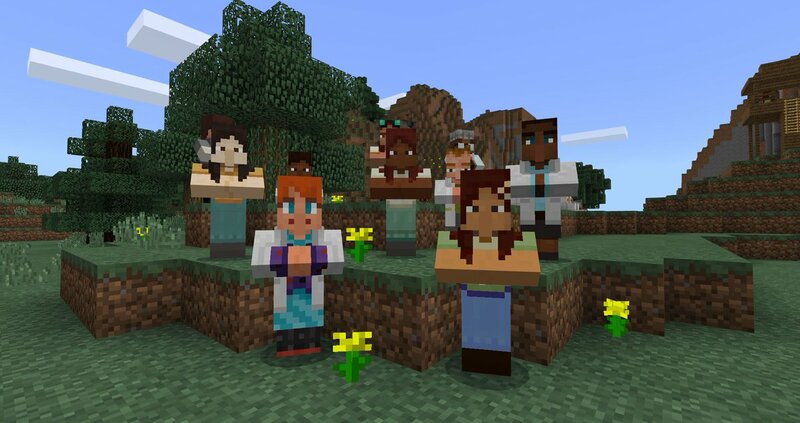 Minecraft is easy to use and implement in a classroom. It promotes student independence and creativity, but it is also an immensely collaborative tool that I have witnessed being integrated across all grade levels and content areas. Students can apply their understanding in truly unique and often unanticipated ways. Previously, my kids struggled with writing. Her students were excited and her principal was proud, but Kelly Jeppson was surprised. “Here I am this English teacher and I’m a finalist in a STEM contest.” Jeppson, however, led the push to introduce a maker class at Summit Academy’s junior high, which began this term. Eighteen students are enrolled, many of whom helped brainstorm ideas and gave input in the $2 million Samsung Solve for Tomorrow Contest application. The National Flight Academy will host STEM Saturday on Feb. 16 from 9:30 a.m. to 2:30 p.m. for 3rd- through 8th-grade students. February’s STEM Saturday topic is “Ocean Survival.” Students will learn how to use survival equipment and strategies they will need in order to survive out at sea. This opportunity provides hands-on experience with a focused curriculum that engages local students in STEM education tenets. I remember the whirlwind of applying to Ph.D. programs, waiting what felt like an eternity for decisions and experiencing the anxiety of choosing between offers. Hours turned into days of deliberation, prayer, soliciting advice and finally making a decision. Then came buying a house, saying our goodbyes, making the big move, then finding a preschool and a church, trying to make new friends, and getting used to a totally different area of the country. Robert Morris University is adding on to its Energy Innovation Center. The university announced Monday that it would be opening a state-of-the-art additive manufacturing laboratory at the center, located in the Lower Hill District of Pittsburgh. The laboratory will be operated by the university’s School of Engineering, Mathematics and Science. Like many girls her age, 12-year-old Calafia Hill, a seventh-grader at Hughes Middle School, struggles with self-confidence. “I really want to boost my self-esteem, but it’s hard,” she said. “I’m hoping I can learn from other women.” Hill was one of about 200 seventh- and eighth-graders to participate in the third annual Young Women’s Empowerment Conference on Saturday at Browning High School. BLISTS (Black and Latinx Information Science and Technology Support) is kicking off the Spring semester with a collaboration with NSBE at Syracuse University (National Society of Black Engineers) to host our 3rd Annual STEM Networking Fair on Tuesday, February 5th. In addition to the Career Fair going on at the iSchool, this event is the perfect opportunity to network with a panelist of BLISTS and NSBE alums who can give you career advice and pass your resume along to their respective companies.